Laone T. Desert is a dreamer, a visionary, activist and entrepreneur who sees the world through the eyes of curiosity and tries to finds ways to quench her curiosity. 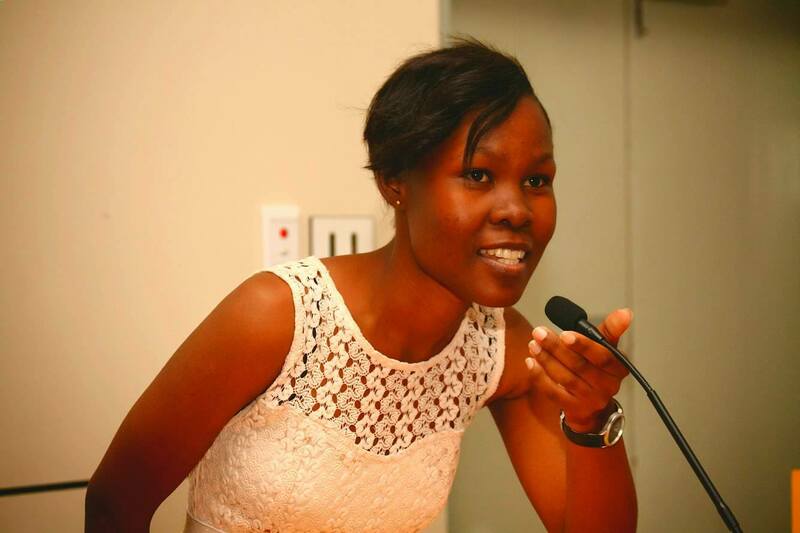 She is driven by her dream to see a better Africa, a better Botswana….sustainable and self dependent. Live today like tomorrow will not come. Achieve daily. Well, I am currently working on a project called The Business Intervention which is an project that aims to address the issue of unemployment in Botswana and believing to expand into other African countries. Unemployment is a global concern and the most affected are the youth and matters have gotten out of control that we now see graduates on the streets failing to find secure and sustainable jobs. The mandate of The Business Intervention initiative is to create awareness on entrepreneurship and how students can take advantage of it to secure their future in an already saturated market. We present entrepreneurship as a viable career path. The birth of The Business Intervention was brought by the escalating number of graduate unemployment and a solution had to be found. It was called for, a need for intervention arose and this initiative became the answer. What experiences led you to start your venture? As a final year student at the University of Botswana, the reality of me finishing school is finally kicking in and had me wondering much about my future. Questions like; what am I going to do after graduating? There are no jobs, what other alternative do I have? Am I in a position to change the situation that I am sure is not only affecting me but those in the same class as me? So I sat down and mapped a plan to come up with an initiative that would help many graduates and final year students to plan their university exit well in time and to start engaging in entrepreneurial activities as early as possible so that when they graduate they would have already built companies, enterprises that would sustain them if they do not find formal employment. The Business Intervention looks beyond its own interests and accommodates the interest of those it is intended to serve. I am bringing a solution to a social problem that does not only affect my country but the globe at large. Unfortunately for my country the impacts are newly felt yet harsh hence the need for aggressive intervention. To make effort towards changing university students’ perspective towards entrepreneurship as a way of addressing the issue of graduate unemployment. To accelerate the induction of entrepreneurship into Universities. To improve varsity students’ engagement in investment, wealth creation and entrepreneurial activities. All our services are geared towards meeting these objectives and changing the lives of those who come to us for help. How do you creatively promote your company? We have used our facebook page to reach out to our target group, we host business seminars and events to generate more interest on our offerings. And we have an annual leadership and entrepreneurship seminar dubbed The Business Intervention and for this year 2017 we pooled from across the city universities hundreds of university student and grabbed the attention of more than two thirds of Botswana’s media houses from newspapers, radio stations to television. We also engaging with different universities to have the initiative registered as a club in their schools so that we can easily reach to the target audience and closely service them. I am today’s leader and tomorrow’s legend. My biggest failure would be starting off too late. And my biggest success would be starting anyway despite the time. I have learnt that indeed the race is not for the swift, what matters most is to get to the finish line successfully. To become an entrepreneur means to step out of the ordinary and become an extraordinary person. You have to think like an entrepreneur, act like an entrepreneur, communicate like an entrepreneur. BE EXTRAORDINARY, LIVE ENTERPRENEURSHIP. Teach us, how do you become the best at what you do? I have learnt the art of consistency and gradual improvement as a necessity to succeeding as a leader/enterpreneur. Inconsistency brings doubt and makes one questionable and gradual improvement allows one to change with a caution placed on adaptability. So, as an Entrepreneur or leader one has to learn how to be consistent lest his competency be questioned and if he is to change an existing norm or improve it he should do it gradually so that those affected can easily adapt without having to stomach too much at a time. I have learnt how to maintain a balance in my busy life. No area of my life has to suffer the most at the expense of another. Balance, consistency and focus makes great leaders. Why is it that, with everything availed and achieved, one still feels like there is something missing in their lives? This is simply because one has not realised his purpose and his souls is in constant grief and plea. Until we fulfil that purpose, the void and the thirst will remain there. I start my day with a short prayer and end it with one. I map my day before I get out of bed and every evening when I get to the house I make sure I reflect on it before doing anything else. Gives me balance and focus. First define the type entrepreneur you are and why you entered business in the first place. Then you will understand as to whether to focus on profit making or impact. I see The Business Intervention impacting many lives across Botswana and neighbouring countries and myself as fulfilled game changer who has actually changed the game. Very inspiring and encouraging! This is what Botswana needs, May God help you drive the change from Botswana on to Africa and across the world!